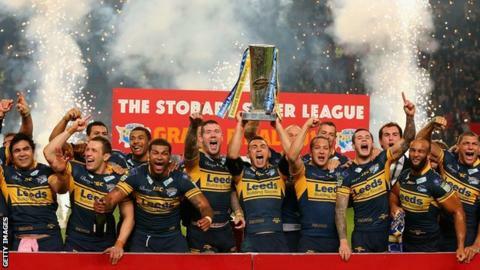 Defending Super League champions Leeds repeated their Old Trafford magic to beat Warrington in the Grand Final and claim a record sixth title. Rhinos skipper Kevin Sinfield's 14-point haul helped his team once again come from fifth place to triumph. It was 14-14 at the break, man of the match Sinfield and Ben Jones-Bishop wiping out Richie Myler's lead, only for Joel Monaghan to respond for Wire. But second-half tries from Carl Ablett and Ryan Hall saw Leeds home. Warrington centre Ryan Atkins was the first to score after the break, but the champions once again held their nerve on the rugby league season's biggest stage. Brett Hodgson kicked two of his three conversions and a penalty for the Challenge Cup holders, but it was not enough. Saturday's game was a repeat of the Challenge Cup final in August, And, in their first Grand Final, the Wolves were hoping to become the first team since St Helens in 2006 to do the double. But Leeds wrecked their old coach Tony Smith's hopes of becoming the first man to win the Super League with two different clubs. Sinfield, who has led his side to all of their six titles, maintained his record with the boot in the play-offs, in which he has been successful with all his 21 kicks, to thoroughly deserve his second Harry Sunderland Trophy for man-of-the-match. And former England captain Jamie Peacock, appearing in his 10th Grand Final, won his eighth winner's ring. Whatever fans, coaches, players and pundits make of the play-off system, with Leeds winning it from fifth place in the table for a second year running, the Rhinos are the master exponents of it. Brian McDermott has now led his side to the last four domestic finals, coupled with last year's win in the World Club Challenge, which the Rhinos will now contest in the new year, once again against Melbourne Storm. With both sides back to full-strength, the omens were good, as was the weather on a sun-kissed evening in Manchester. Amidst a wall of noise from the 70,676 Old Trafford crowd, Warrington kicked off and, after surviving a Leeds repeat set, drew first blood on three minutes. Successive drives from Mickey Higham and Ben Westwood teed up a Lee Briers bomb that Leeds fumbled and, after Chrs Riley was held up, a quick release from the play-the-ball picked out Myler, who slipped through a gap to touch down, Hodgson converting. Last season's final against St Helens had turned on a moment of magic by Rob Burrow, but it was a team effort rather than individual flair that hauled the Rhinos back into it this time. With a score chalked off for a forward pass when Sinfield's sublime cut-out-ball tracked Hall out wide, they eventually scored the try their growing influence deserved through a well-worked move in the left corner on 18 minutes. Sinfield's high-ball was tapped down to Ablett by Hall, only for the centre to be blocked. But he offloaded to Sinfield, the man who had began the move, who stretched out an arm to ground his own converted score. In his seventh final as captain, Sinfield then drilled his kick over for two points six minutes later when Westwood was penalised for interference to give Leeds the lead for the first time. And, on 27 minutes, they punished further Wolves indiscipline with a second try. Leeds worked the ball right and Danny McGuire's pass found Jones-Bishop, who held off the defence in the corner to record his 14th try of the campaign. Warrington refused to buckle, turning round an eight-point deficit when Briers found the deadly Monaghan on the right to bring them within two after Hodgson's kick. And they pulled level when 2009 Man of Steel Hodgson was on target to level on the hooter. The second period began in the same fashion as the first, with Smith's side making the brighter start. Leeds full-back Hardaker spilled after a huge hit to turn over inside the 20, and Warrington worked the ball through Myler and Hodgson to feed Atkins who powered over in the left corner, Hodgson failing to convert. But Wire's lead once again did not last a quarter of an hour, Ablett crashing onto Lunt's ball from dummy half to score following Kylie Leuluai's drive to level before Sinfield added the extra to put his side back in front at 20-18. And it took a try of genuine quality to seal victory for the Rhinos. Hall finished it in the left corner, but the build-up which took the play from left to right and back again involved sparkling handling from Kallum Watkins, Danny McGuire and Ablett. Burrow's 40-20 late on bought breathing space as the time ticked away. And, when the hooter sounded, Leeds were left to celebrate another remarkable season of success in the blue and amber. "We've been here before. We've been behind. When they scored first at the start, Jamie Jones-Buchanan said 'We've been here before fellas, we never score first'. "But you just don't stop believing. Thankfully we found a way to win. We're getting good hidings throughout the year and things aren't going well but you stick with it. "The club's special. Not just the players, not just the coaches, the backroom staff, our fans, our families." "Kevin Sinfield is a terrific player. One of the best club players I have seen over here. "He contributes in a massive way, not just in his performances on the field but off it. "He's a steady thinker and steady hand, he does everything right and he is a real inspiration. "I'm proud to have been associated with him and to have coached him." "The pressure on the players to come up with the goods is immense. To get in the play-offs, in every game we've played, there's been such an amount of pressure. "We created history last year doing it from fifth. And we've had some games where we can't work out what they're trying to achieve. "But they must be as proud as punch, because this has been an incredible victory. Every one of them, they're brilliant. They deserve a huge amount of credit. It's unbelievable working with them." Warrington: Hodgson; Riley, Ratchford, Atkins, J Monaghan; Briers, Myler; Harrison, Higham, Hill, Westwood, Waterhouse, Grix. Replacements: Cooper, M Monaghan, Wood, Morley. Leeds: Hardaker; Jones-Bishop, Watkins, Ablett, Hall; McGuire, Sinfield; Leuluai, Burrow, Peacock, Jones-Buchanan, Delaney, Bailey. Replacements: Kirke, Lunt, Ward, Griffin.